Lucille Thomas (seated left), Roy Weikert (center) and Mildred Dill (seated right) were honored as the oldest fairgoers at the 2018 Darke County Fair. All three of them are 104 years old. 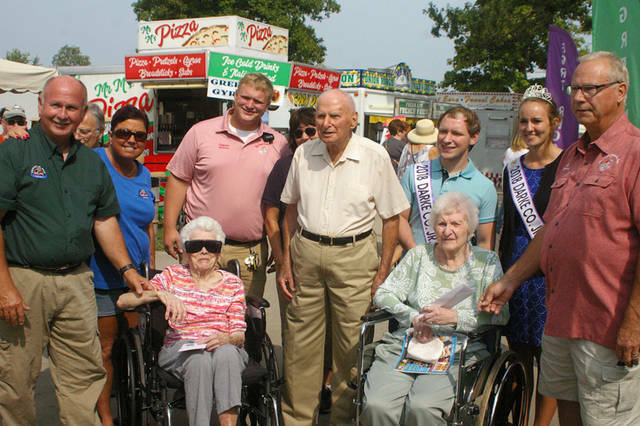 GREENVILLE – Three Darke County residents, each 104 years old, were recognized as the oldest attendees of the 2018 Darke County Fair on Monday. Mildred Dill from Versailles Health Care Center, Lucille Thomas from Greenville and Roy Weikert from Brethren Retirement Community each received a $100 prize for being the oldest fairgoers during a ceremony on Monday morning. Dill and Thomas shared the title of oldest fairgoer for a second consecutive year, and Thomas also was the oldest fairgoer in 2016. Both women were born on Sept. 10, 1913. This year the Fair expanded the competition to recognize an oldest man and woman. Weikert, who in 2015 was the oldest fairgoer overall, was recognized as the oldest man at this year’s Fair. He was born Oct. 22, 1913. Weikert, a Covington native, said he moved to Brethren Retirement Community in 2003 after living in California in a scenic area near Yosemite National Park for 22 years. He attributes diet, exercise and never being married among the reasons for his longevity. Weikert walks daily, although he tries to not overexert himself. Dill enjoys playing bingo and praying daily at Versailles Health Care Center. Thomas still lives in her own home and strives to remain active at 104 years old.